Tag are working in partnership with a well-established Portable Gas Detection manufacturer, whose mission is to have dominance in the marketplace for their products. Due to expansion, they are keen to hire a Sales Manager to manage the region of Benelux, the focus is on the sales effort on the “end user” with a pull and push strategy with distribution partners. An ethical and aggressive business developer with a strong work ethic. 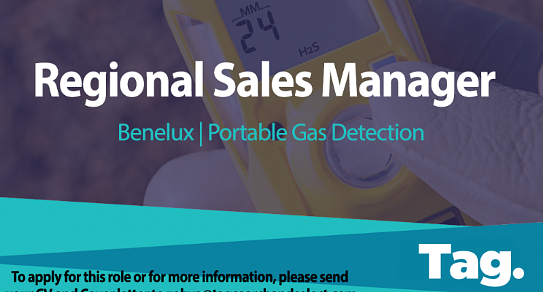 Have experience successfully selling portable gas detection instrumentation into the defined territory. An organised self-starter that is willing to accept personal responsibility with the type of entrepreneurial mindset necessary to grow the region into a productive and profitable enterprise. Experience developing and maintaining strong end-user relationships that promote successful pull-through sales. 3+ year record of success in gas detection instrumentation, sales, and business development. Have a sound understanding of the principles of safety products and services, specifically gas detection instrumentation. Driving company sales of products to the industrial, oil and gas, utility and steel mill markets through qualified distribution via building relationships and consultative end-user pull through sales. Responsible for establishing a motivated network of distributors and for developing and implementing business objectives and sales strategies required to aggressively expand regional revenues. Daily presence within the territory with a strong focus on key territorial market verticals. Evaluate the current market trends for gas detection instrumentation requirements in the territory and share this information with relevant management. Be able to effectively negotiate pricing, technical specifications and supply terms. Provide a concise call report, weekly submitted, showing detail on the subject week’s calls and marketing activities. Participate in a monthly territorial sales forecast conference call forecasting anticipated sale for individual products, along with any customer information that is important to the growth and maintenance of the region. Consistently stay up-to-date of and communicate safety requirements to new and existing customers throughout the region.